In the works of Ivan Aivazovsky, a significant place is occupied by paintings on the theme of sea battles and victories of the Russian fleet. The artist led a kind of chronicle of historical events, from the time of Peter I and ending with the battles in the Crimean War of 1853-1856 and the liberation of the Balkans in the Russian-Turkish war of 1877-1878. Aivazovsky was a contemporary of many battles, which later depicted on his canvases. The painting “Sinope battle” immediately attracts the eye with its unusual for the marine theme color. The picture is as if illuminated by flashes of red. 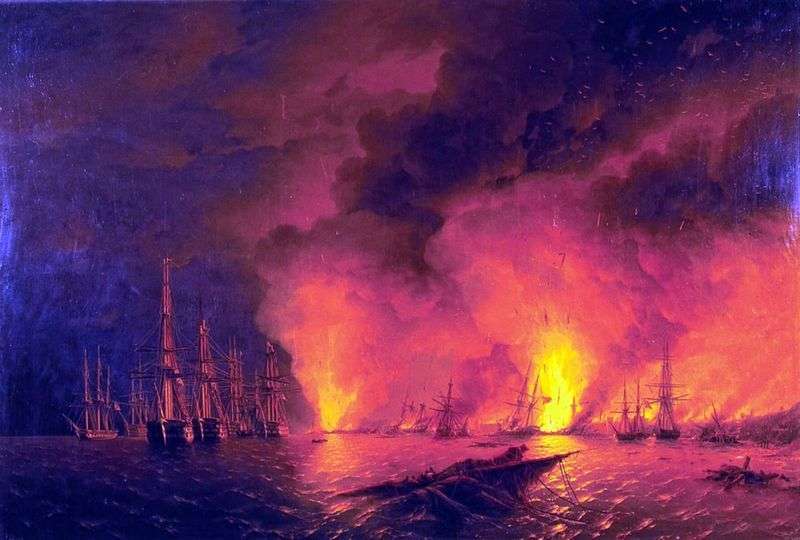 The artist portrayed the moment when the Turkish squadron was completely destroyed and the wreckage of enemy ships burned, cast off from the salvoes of the Russian fleet, illuminating the whole environment with fire. Russian battle ships calmly and solemnly march along the flat sea surface. In the sky rise clouds of smoke, lit by the light of fire. The overall color of the picture consists of black and red colors, which seem to divide the space on the canvas. Despite the victory of the Russian fleet, any battle is a tragic event, bringing death to people. And such a color solution of the composition of the picture sates it with this tragedy and drama. Admiral Nakhimov personally visited the exhibition and noted the great work of Aivazovsky, in particular the painting depicting the Sinope battle at night. He said that the picture was written with great accuracy and correctly reflects the events that took place. Description and meaning of the painting Sinop fight at night by Ivan Aivazovsky.